The PyVCP (Python Virtual Control Panel) is designed to give the integrator the ability to customize the AXIS interface with buttons and indicators to do special tasks. Hardware machine control panels can use up a lot of I/O pins and can be expensive. That is where Virtual Control Panels have the advantage as well as it cost nothing to build a PyVCP. Virtual Control Panels can be used for testing or monitoring things to temporarily replace real I/O devices while debugging ladder logic, or to simulate a physical panel before you build it and wire it to an I/O board. The following graphic displays many of the PyVCP widgets. For a list of widgets and their tags and options, see the widget reference below. If you are new to HAL, the HAL basics chapter in the Integrator Manual is a good place to start. Parts of PyVCP files are evaluated as Python code, and can take any action available to Python programs. Only use PyVCP .xml files from a source that you trust. Since AXIS uses the same GUI toolkit (Tkinter) as PyVCP, it is possible to include a PyVCP panel on the right side of the normal AXIS user interface. A typical example is explained below. assuming that a signal called spindle-rpm-filtered already exists. Note that when running together with AXIS, all PyVCP widget HAL pins have names that start with pyvcp.. This is what the newly created PyVCP panel should look like in AXIS. The sim/lathe configuration is already configured this way. This section describes how PyVCP panels can be displayed on their own with or without LinuxCNC’s machine controller. You would use this if you wanted a floating panel or a panel with a GUI other than AXIS. -Wn panelname - makes HAL wait for the component panelname to finish loading (become ready in HAL speak) before processing more HAL commands. This is important because PyVCP panels export HAL pins, and other HAL components will need them present to connect to them. Note the capital W and lowercase n. If you use the -Wn option you must use the -c option to name the panel. pyvcp < -g> < -c> panel.xml - builds the panel with the optional geometry and/or panelname from the xml panel file. The panel.xml can be any name that ends in .xml. The .xml file is the file that describes how to build the panel. You must add the path name if the panel is not in the directory that the HAL script is in. -g <WxH><+X+Y> - specifies the geometry to be used when constructing the panel. The syntax is Width x Height + X Anchor + Y Anchor. You can set the size or position or both. The anchor point is the upper left corner of the panel. An example is -g 250x500+800+0 This sets the panel at 250 pixels wide, 500 pixels tall, and anchors it at X800 Y0. -c panelname - tells PyVCP what to call the component and also the title of the window. The panelname can be any name without spaces. 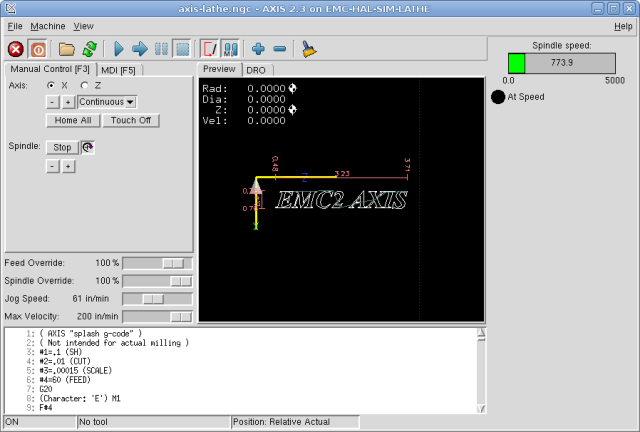 You would use this if you want a panel without LinuxCNC’s machine controller such as for testing or a standalone DRO. The loadusr command is used when you also load a component that will stop HAL from closing until it’s done. If you loaded a panel and then loaded Classic Ladder using loadusr -w classicladder, CL would hold HAL open (and the panel) until you closed CL. The -Wn above means wait for the component -Wn "name" to become ready. (name can be any name. Note the capital W and lowercase n.) The -c tells PyVCP to build a panel with the name panelname using the info in panel_file_name.xml. The name panel_file_name.xml can be any name but must end in .xml - it is the file that describes how to build the panel. You must add the path name if the panel is not in the directory that the HAL script is in. This tells HAL to wait for component panelname to close before continuing HAL commands. This is usually set as the last command so that HAL shuts down when the panel is closed. HAL signals come in two variants, bits and numbers. Bits are off/on signals. Numbers can be float, s32 or u32. For more information on HAL data types see the HAL Data section. The PyVCP widget can either display the value of the signal with an indicator widget, or modify the signal value with a control widget. Thus there are four classes of PyVCP widgets that you can connect to a HAL signal. A fifth class of helper widgets allow you to organize and label your panel. Each widget is described briefly, followed by the markup used, and a screen shot. All tags inside the main widget tag are optional. Otherwise, the string is accepted as a string. When the tag-based syntax is used, the text within the tag is always evaluated as a Python expression. The examples below show a mix of formats. To add a comment use the xml syntax for a comment. Edit the XML file with a text editor. In most cases you can right click on the file and select open with text editor or similar. Colors can be specified using the X11 rgb colors by name gray75 or hex #0000ff. A complete list is located here http://sedition.com/perl/rgb.html. HAL pins provide a means to connect the widget to something. Once you create a HAL pin for your widget you can connect it to another HAL pin with a net command in a .hal file. For more information on the net command see the HAL Commands section. A label is a way to add text to your panel. <text>"text"</text> - the text to put in your label, a blank label can be used as a spacer to align other objects. <bd>n</bd> - where n is the border width when RAISED or SUNKEN borders are used. <padx>n</padx> - where n is the amount of extra horizontal extra space. <pady>n</pady> - where n is the amount of extra vertical extra space. The label has an optional disable pin that is created when you add <disable_pin>True</disable_pin>. The above code produced this example. An extention of the text label. Selectable text label, can display up to 6 label legends when associated bit pin is activated. Attach each legend pin to a signal and get a descriptive label when the signal is TRUE. If more than one legend pin is TRUE, the highest numbered TRUE legend will be displayed. If a disable pin is created with <disable_pin>True</disable_pin> and that pin is set to true the lable changes to a grayed out state. The above example would create the following pins. If you have more than one multilabel the pins created would increment the number like this pyvcp.multilabel.1.legend1. A LED is used to indicate the status of a bit halpin. The LED color will be on_color when the halpin is true, and off_color otherwise. <halpin>name</halpin> - name of the pin, default is led.n, where n is an integer that is incremented for each LED. <on_color>color</on_color> - sets the color of the LED when the pin is true. default is green. See colors for more info. <disable_pin>false</disable_pin> - when true adds a disable pin to the led. <disabled_color>color</disabled_color> - sets the color of the LED when the pin is disabled. This is a variant of the led widget. The above code produced this example. Also showing a vertical box with relief. A button is used to control a BIT pin. The pin will be set True when the button is pressed and held down, and will be set False when the button is released. Buttons can use the following optional options. <activebackground>"color"</activebackground> - the cursor over color. <fg> "color"</fg> - the forground color. <bg>"color"</bg> - the background color. A text button controls a bit halpin. The halpin is false until the button is pressed then it is true. The button is a momentary button. The text button has an optional disable pin that is created when you add <disable_pin>True</disable_pin>. A checkbutton controls a bit halpin. The halpin will be set True when the button is checked, and false when the button is unchecked. The checkbutton is a toggle type button. The Checkbuttons may be set initially as TRUE or FALSE the initval field A pin called changepin is also created automatically, which can toggle the Checkbutton via HAL, if the value linked is changed, to update the display remotely. The above code produced this example. The coolant checkbutton is checked. Notice the extra spaces in the Chips text to keep the checkbuttons aligned. A radiobutton will set one of the halpins true. The other pins are set false. The initval field may be set to choose the default selection when the panel displays. Only one radio button may be set to TRUE (1) or only the highest number pin set TRUE will have that value. Note that the HAL pins in the example above will me named my-radio.one, my-radio.two, and my-radio.three. In the image above, one is the selected value. The number widget displays the value of a float signal. <format> - is a C-style format specified that determines how the number is displayed. The s32 number widget displays the value of a s32 number. The syntax is the same as number except the name which is <s32>. Make sure the width is wide enough to cover the largest number you expect to use. The u32 number widget displays the value of a u32 number. The syntax is the same as number except the name which is <u32>. 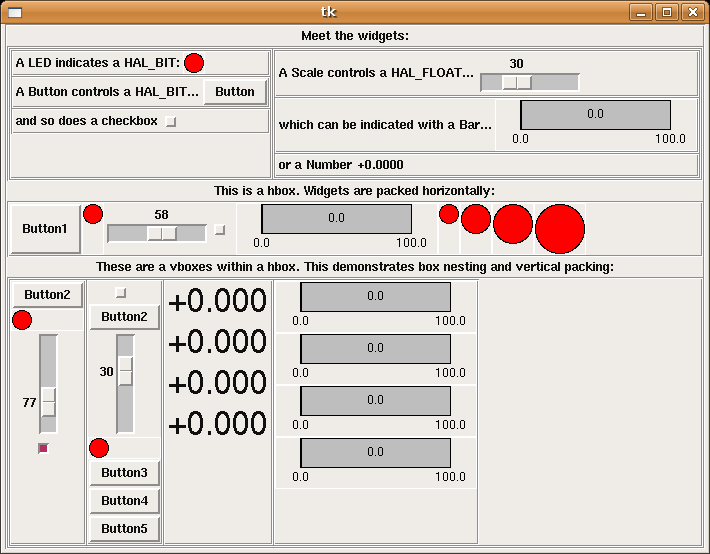 A bar widget displays the value of a FLOAT signal both graphically using a bar display and numerically. The color of the bar can be set as one color throughout its range (default using fillcolor) or set to change color dependent upon the value of the halpin (range1, range2 range3 must all be set, if you only want 2 ranges, set 2 of them to the same color). 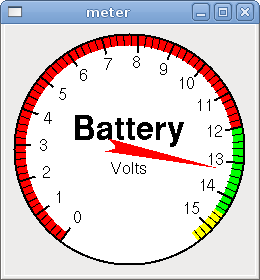 Meter displays the value of a FLOAT signal using a traditional dial indicator. Spinbox controls a FLOAT pin. You increase or decrease the value of the pin by either pressing on the arrows, or pointing at the spinbox and rolling your mouse-wheel. If the param_pin field is set TRUE(1), a pin will be created that can be used to set the spinbox to an initial value and to remotely alter its value without HID input. Scale controls a float or a s32 pin. You increase or decrease the value of the pin be either dragging the slider, or pointing at the scale and rolling your mouse-wheel. The halpin will have both -f and -i added to it to form the float and s32 pins. Width is the width of the slider in vertical and the height of the slider in horizontal orientation. If the param_pin field is set TRUE(1), a pin will be created that can be used to set the spinbox to an initial value and to remotely alter its value without HID input. 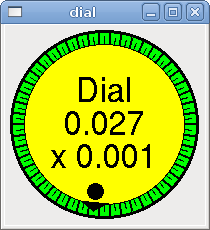 The Dial outputs a HAL float and reacts to both mouse wheel and dragging. Double left click to increase the resolution and double right click to reduce the resolution by one digit. The output is capped by the min and max values. The <cpr> is how many tick marks are on the outside of the ring (beware of high numbers). If the param_pin field is set TRUE(1), a pin will be created that can be used to set the spinbox to an initial value and to remotely alter its value without HID input. 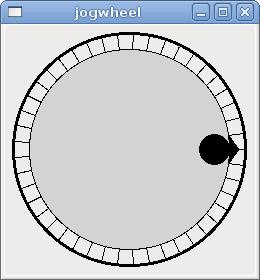 Jogwheel mimics a real jogwheel by outputting a FLOAT pin which counts up or down as the wheel is turned, either by dragging in a circular motion, or by rolling the mouse-wheel. Image displays use only .gif image format. All of the images must be the same size. The images must be in the same directory as your ini file (or in the current directory if running from the command line with halrun/halcmd). The image_bit toggles between two images by setting the halpin to true or false. This example was produced from the above code. Using the two image files fwd.gif and rev.gif. FWD is displayed when selectimage is false and REV is displayed when selectimage is true. The image_u32 is the same as image_bit except you have essentially an unlimited number of images and you select the image by setting the halpin to a integer value with 0 for the first image in the images list and 1 for the second image etc. The above code produced the following example by adding the stb.gif image. Notice that the default is the min even though it is set higher than max unless there is a negative min. Containers are widgets that contain other widgets. Containers are used to group other widgets. Container borders are specified with two tags used together. The <relief> tag specifies the type of border and the <bd> specifies the width of the border. <bd>n</bd> - Where n is the width of the border. <boxfill fill ="style"/> - Where style is none, x, y, or both. Default is x for Vbox and y for Hbox. Container anchors are specificed with the <boxanchor anchor=""/> tag. The anchor specifies where to position each slave in its parcel. Valid entries are center, n, s, e, w, for center, north, south, east and west. Combinations like sw, se, nw and ne are also valid. <boxanchor anchor="position"/> - Where position is center, n, s, e, w, ne, nw, se or sw. Default is center. Container expand is specificed with the boolean <boxexpand expand=""/> tag. Valid entries are yes, no. <boxexpand expand="boolean"/> - Where boolean is either yes or no. Default is yes. Use an Hbox when you want to stack widgets horizontally next to each other. Inside an Hbox, you can use the <boxfill fill=""/>, <boxanchor anchor=""/> , and <boxexpand expand=""/> tags to choose how items in the box behave when the window is re-sized.The default is fill="y", anchor="center", expand="yes" for a Hbox. Use a Vbox when you want to stack widgets vertically on top of each other. 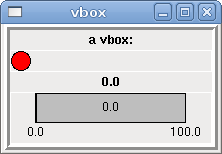 Inside a Vbox, you can use the <boxfill fill=""/>, <boxanchor anchor=""/> , and <boxexpand expand=""/> tags to choose how items in the box behave when the window is re-sized. The default is fill="x", anchor="center", expand="yes" for a Hbox. A labelframe is a frame with a groove and a label at the upper-left corner. A table is a container that allows layout in a grid of rows and columns. Each row is started by a <tablerow/> tag. 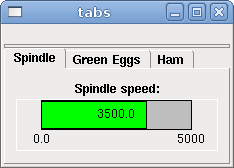 A contained widget may span rows or columns through the use of the <tablespan rows= cols=/> tag. The sides of the cells to which the contained widgets “stick” may be set through the use of the <tablesticky sticky=/> tag. A table expands on its flexible rows and columns. 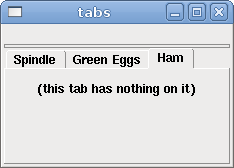 A tabbed interface can save quite a bit of space. The above code produced this example showing each tab selected.